This topic describes the "3D Graphics in C++" sample application implementation. 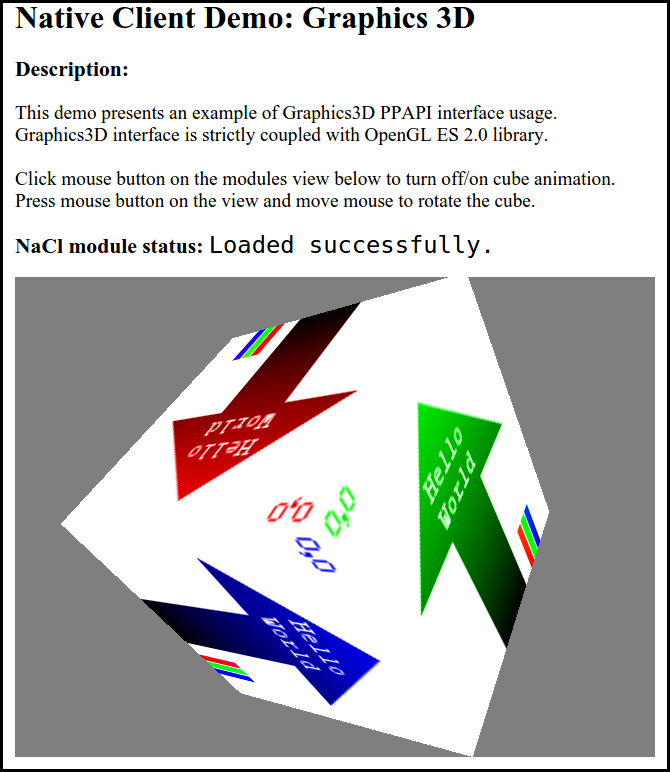 This tutorial describes how to use OpenGL® ES 2.0 to implement an interactive 3D animation in C++ as a Native Client (NaCl) embed object. The sample application renders a rotating, textured cube, whose rotation can be controlled by clicking and dragging the mouse. When the cube is clicked, automatic cube rotation stops. The user can drag the cube to rotate it; mouse movement is correlated to changes in the rotation around the X and Z axes, indirectly changing the rotation matrix values. Clicking the cube again resumes automatic rotation. callback_factory_ simplifies the creation of completion callbacks used to implement the main drawing loop. context_ is a pp::Graphics3D object. width_, height_, and scale_ define the size and scale of the viewport. Various OpenGL handles, such as for shaders, program, and attribute locations. Mouse state variables store the mouse pointer location and button state. x_angle_ and y_angle_ describe the current rotation state of the rendered cube. The DidChangeView() function is called whenever a viewport is created or changed, and it provides information about the viewport, such as its size and location. In the DidChangeView() function, retrieve the device scale and size, initialize OpenGL if necessary, and create the rendering context. Compile and link the shaders to the graphic program, initialize the buffers, and start the rendering loop. If the context was already initialized, resize the buffers to fit the viewport. Initialize the OpenGL® ES library using the glInitializePPAPI() function. Create the attrib_list array with the viewport properties, such as the alpha size (in bits), depth buffer size, and viewport dimensions. Pass the viewport properties to the pp:Graphics3D context constructor. Bind the graphics context to the application viewport using the BindGraphics() function. If viewport binding is successful, the new graphics context is set to active and the InitGL() function returns true. The basic shaders in the sample application convert the cube coordinates into world coordinates and paint the cube with the provided textures. To compile a shader, allocate the needed program memory on the GPU, and load and compile the shader source code. On success, return the shader handle. To link the shaders to the graphics program, allocate space for the program in the GPU, attach the shaders to it, and call the glLinkProgram() function to initiate the link. On success, return the program handle. In the InitBuffers() function, allocate the VBO (Vertex Buffer Object) and IBO (Index Buffer Object) for the cube. Load the cube vertex data (position, UV mapping, and color) into the VBO and populate the IBO with the correct triangle indices. In the InitTexture() function, load the cube texture into the GPU memory. You can load the texture data from the project directory or a remote URL, or you can generate it procedurally. In the sample application, the texture data is loaded from the "texture.cc" file. The MainLoopIteration() function represents a single iteration of the rendering loop. The Animate() function updates the current X and Y rotation values for the cube in each frame. The Render() function renders the graphic. At the end of the MainLoopIteration() function, the SwapBuffers() function is called on the context. It triggers a completion callback, which calls the MainLoopIteration() function again. Clear the current frame buffer, depth buffer and reset all drawing flags. Create arrays that contain transformation matrix data. Using the helper functions defined in the "matrix.h" file, populate the arrays with a rotation matrix based on the current cube rotation, a translation matrix to move the camera away from the cube, and a perspective matrix with the camera perspective settings. Multiply the rotation, translation, and perspective matrices to obtain a single matrix. Load the matrix to the uniform address in the GPU program. Bind the VBO to the context and load all attributes, such as position, color, and UV mapping) into GPU memory. Bind the IBO to the current context. Call the glDrawElements() function to draw the cube to the frame buffer.